Dave Wolfenden checks out this new product from Aqua Medic, which will be of particular interest to any marine fishkeeper who struggles with high temperatures during the summer. 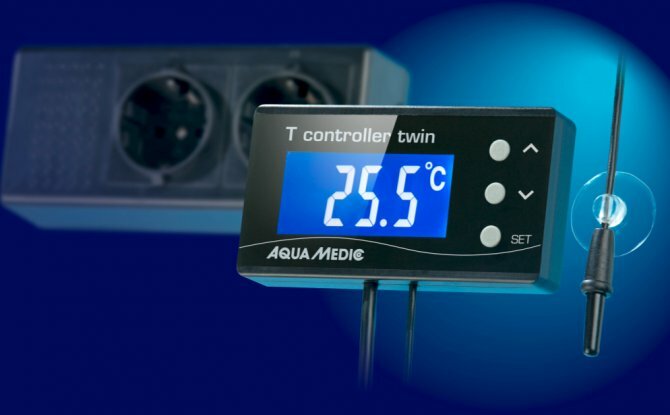 An alternative to expensive chillers on reef tanks is the use of fans to employ evaporative cooling, and Aqua Medic’s T controller Twin is presumably aimed at folks using this method, as most chillers will be thermostatically controlled in their own right. It includes a set of two plug sockets, one for heaters and one for chillers or fans, with a total load of 1200w for each socket (although Aqua Medic recommends a maximum of 400w for chillers due to the initial current draw). Connected to the sockets is a small display, the 'brains' of the outfit, and from this a dinky sensor, which is placed in the aquarium or sump. Cable lengths are very generous. A pair of Velcro pads is included for attaching the controller to a convenient place, and the socket unit can be hung in place thanks to a screw fixing. Crucially, socket 1 is for cooling devices, and socket 2 is for heaters. This unit comes into its own when using non-thermostatically-controlled heaters, although heaterstats could be used too – just remember to set the thermostat slightly higher than the set point on the controller; otherwise, you’ll run the risk of the controller switching on power to the heater and the heater having other ideas. The sensor is fixed in place in the sump or aquarium, using the supplied sucker. Plug the unit into the mains and the display lights up. Connect the fan or chiller to socket 1 and the heater to socket 2. Pressing the ‘set’ key will allow the set point (or target temperature of the aquarium) to be entered (adjustable in increments of 1°C, ranging from 16°C to 40°C/61-104°F). You’ll need to set the hysteresis — the range around the set point at which the heater and cooler won’t switch on. This is useful to prevent the equipment rapidly switching on and off (although set it too wide and the aquarium’s temperature can fluctuate excessively). A further press of the 'set' key allows for the selection of the temperature at which the cooler will switch on, denoted by an illuminated snowflake symbol. Another press of the ‘set’ key and a sun symbol illuminates to allow the selection of the heater trigger point. So, if the set point is programmed as 26°C/79°F and the range set at 1°C either side, the heater will switch on when the temperature reaches 25°C/77°F, and it stops when the temperature reaches 26°C/79°F; if 27°C is reached, the chiller or fan is activated, and then deactivated again at 26°C/79°F. The unit won’t allow heating and cooling to work together and has an inbuilt 'deactivation' time; so, once heating or cooling has switched off, it needs three minutes before it will allow any further activation. The digital display switches off after several minutes — it would have been nice for this to be permanently illuminated, so the tank temperature can be seen at a glance. Heating and cooling won’t work when the power’s off, of course, but at least when it comes back on, your settings will be saved, which is handy in the event of a power cut. Would be nice if display was illuminated permanently.